Specialists such as sports scientists and exercise physiologists are concerned about the performance of their athletes and clients. Performance, however, hinges on health and therefore a large part of these workouts are focused on fine turning diet, ensuring recovery occurs, maintaining muscle mass gains and other various training outcomes to prevent injuries. This constant reinforcement regarding how a healthy lifestyle impacts athletic performance should improve not just the individual’s overall health but their health knowledge as well. Many of our athletes/clients are older women who row and so in the summer of 2018 we began recruitment for the ROWER study (Reducing Osteoporosis in Women that Exercise through Rowing). Osteoporosis is an illness that increases with age and 30-40% of postmenopausal women struggle with the consequences of a non-traumatic fracture. Following the rules of osteoporosis prevention is important because of the asymptomatic nature of the disease. These rules are not unlike our training philosophy and these actions together support the maintenance of appropriate bone mass through a balanced diet, supplementation of calcium and vitamin D3, and appropriate load bearing physical activity. We weren’t sure if our older female rowers were aware of osteoporosis or how much knowledge they had on prevention. So, we decided to interview them and test their knowledge level. Qualitative research can provide insight towards understanding an individual’s perspective because participants’ behavioural choices are supported by sharing their thoughts, feelings, and experiences. We combined this semi-structured interview with the Osteoporosis Knowledge Assessment Test (OKAT). We collected, both forms of data concurrently and integrated them for the interpretation of the overall results. The deliberate use of a mixed method approach allows us to generalize from a small sample, such as ours, to a population (Anderson, 2010). The OKAT, is a validated and reliable questionnaire comprised of 20 multiple-choice questions on knowledge (Q1-12), attitude to osteoporosis (Q13-16), and practice and perception towards the prevention of osteoporosis (Q17-20) (Winzenberg et al., 2003). Each question has three choices: true, false, or I don’t know. We added question 21, to explore participant’s awareness of the prevention of bone loss through load bearing activity. We administered it at the end of the interview and the interviewer immediately scored and reviewed the results with each participant. A brochure summarizing the answers was given as a takeaway reference. Nine educated (minimum of an undergrad degree) participants, six who were post-menopausal with an age range of 49-61 years were interviewed. Surprisingly, six had experienced a previous fracture and had a family history of fractures, and two participants were taking medication for osteoporosis. The level of rowing was from recreational to the last athlete cut from an Olympic team. The semi-structured interview included general health characteristics, rowing history, and osteoporosis knowledge related questions. The interviews were read and coded for reoccurring themes using NVivo 12©. Saturation was reached when no new codes occurred in the data and interviews were discontinued (Urquhart, 2013). 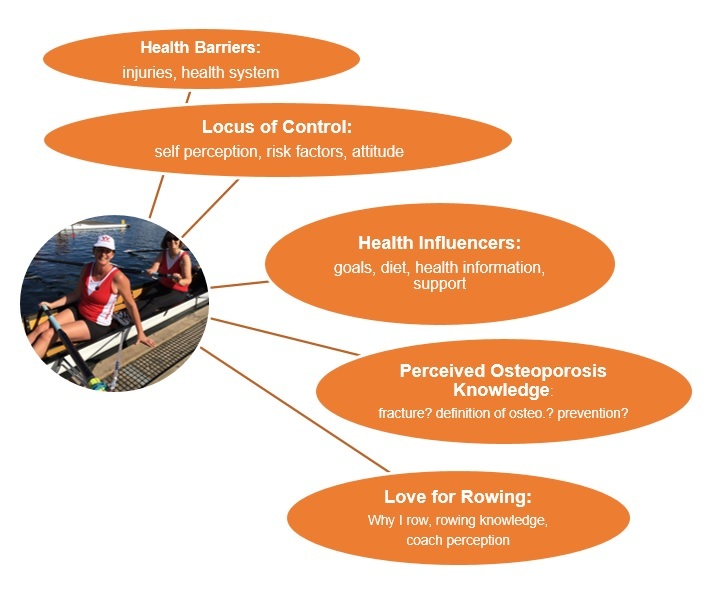 The significant quotes were extracted (see examples below) to illustrate the emerging themes: 1. love for rowing, 2. health barriers, 3. perceived osteoporosis knowledge, 4. health influencers and 5. locus of control (see Figure 1). Figure 1. Five Themes from Semi-Structured Interviews. Our participants’ OKAT scores (11/20) were greater than other populations including eleven slightly younger women we surveyed who had not rowed (9/20). Admittedly, we were surprised that their knowledge was so low based on a correct response rate of 55%. Participants, however, spoke positively about the health benefits of rowing such as weight control and feeling stronger. Rowing, served as an opportunity for them to be connected and they enjoyed the camaraderie and these attributes address the positive mental health perspective of activity. Finally, our participants identified that rowing may prevent osteoporosis, but were not able to differentiate between weight bearing and non-weight bearing activities and the asymptomatic nature of osteoporosis. Three participants believed swimming to be a resistance exercise, suggesting confusion exists with what constitutes load bearing activities. The interdisciplinary nature of our research provided an appropriate venue for exploring osteoporosis and the benefits of older women and their rowing experiences. We admit as coaches and researchers to ‘having a moment’ and this caused us to reflect on our assumptions and clearly we must up the transparency of our training focus with older athletes/clients. In conclusion, the ROWER study provided a boatload of information and these findings will help to promote the discussion concerning older women, exercise, and osteoporosis education.